Prior to 2014, Interstate 164 was the designation for the 21-mile long freeway spur linking Interstate 64 with the city of Evansville. Renumbered as a southward extension of Interstate 69, the freeway connects Downtown Evansville and the U.S. 41 Twin Bridges across the Ohio River with Newburgh and the eastern suburbs. Interstate 164 proposed on the Rand McNally North American Road Atlas in 1976. While appearing on maps in 1976, construction on Interstate 164 was still many years away. Interstate 164 was signed as an east/west route between Exits 0 and 5 (SR 662) and with north/south banners from Exit 5 to I-64 (Exit 21). Center line ITS reference markers were posted along the freeway at 2/10th of a mile intervals. Typical of Indiana three digit Interstates, there were no control cities for I-164, although on Interstate 64, Evansville and Henderson, Kentucky were used for southbound. Superseding a portion of SR 57 north from Evansville to Wheatonville, Interstate 164 combined with the state road from a pair of wye interchanges at Exit 19 to I-64. SR 57 emerges from the freeway southwest to Evansville Regional Airport (EVV). The first step in the renumbering of Interstate 164 as I-69 was made at the AASHTO Fall meeting on October 21, 2013. Approval was given then to redesignate 20.70 miles of the 21.39-mile route as an extension of Interstate 69 south from I-64 to U.S. 41 in Evansville. Following approval by the Federal Highway Administration (FHWA), INDOT began replacing signs in November 2014.3,4 The remaining mileage for I-164 represents the connection with Veterans Memorial Parkway, a city-maintained expressway leading west from U.S. 41. State Road 57 merged onto I-164 north at a wye interchange two miles ahead of Interstate 64. Photo taken by Brian Dowd (10/05/02). County Road 800 North crossed over I-164 one mile ahead of Exit 21A for Interstate 64 east to Louisville (Exit 21A). Photo taken 05/27/11. Originally a diamond interchange joined Interstate 64 and Indiana 57 here. When Interstate 164 was built, the exchange was upgraded to a cloverleaf as the new freeway overtook a portion of the state road alignment to the south. Photo taken by Brian Dowd (10/05/02). Interstate 164 transitioned into I-69 north beyond the ramps with I-64. A 1.77-mile segment of Interstate 69 opened to traffic northward to Indiana 67 on October 1, 2009. The succeeding section opened north to Crane and U.S. 231 on November 19, 2012. Photo taken 05/27/11. Interstate 164 travels 161 miles west from Exit 21B to St. Louis. Indiana 57 continues north along I-69 to Indiana 68 east, where it rejoins its original route to Oakland City. Photo taken 05/27/11. Two miles out from the full cloverleaf interchange (Exits 29A/B) with former I-164/SR 57 south and I-69/SR 57 north along Interstate 64 east. Photo taken 11/07/11. Interstate 69 replaced SR 57 north from Exit 29B when it opened to traffic on October 1, 2009. By November 19, 2012, the freeway traveled an additional 65 miles northeast to Crane. SR 57 follows the freeway for 1.77 miles to SR 68 nearby. Photo taken 11/07/11. Exit 29A departed from I-64 east for I-164/SR 57 south. 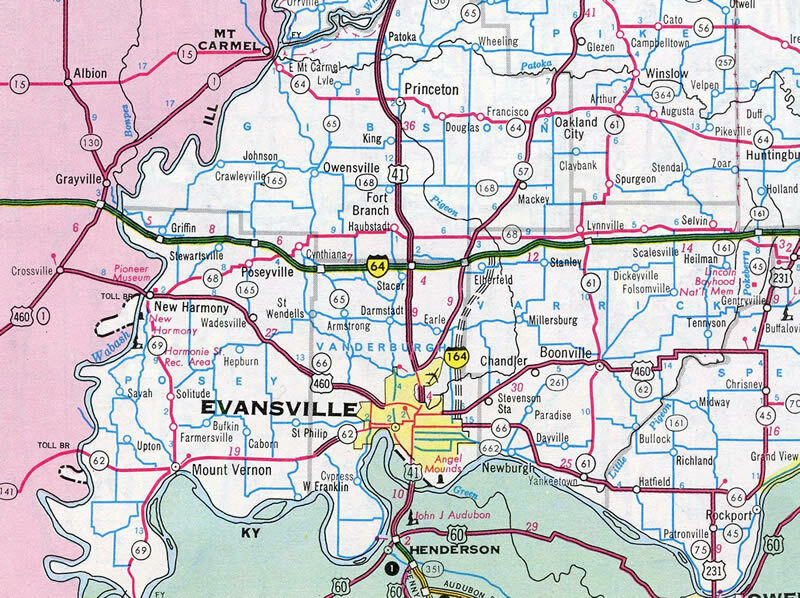 The city limits of Evansville lies 13 miles to the south. SR 57 parts ways with the freeway at the ensuing exit for Daylight and north Evansville. Photo taken 11/07/11. Two miles east of former I-164 south, SR 57 and I-69 on Interstate 64 west. Photo taken 11/07/11. Indiana 57 parallels I-69 north 26 miles to the Pike County seat of Petersburg. Photo taken 11/07/11. Exit 29B connects I-64 with I-69/SR 57 north to SR 68 and nearby Wheatonville. I-69 travels 67 miles northeast to Crane. Photo taken 11/07/11. Interstate 164 extended south from the October 2009-opened I-69 freeway southward to Newburgh, Evansville and U.S. 41 ahead of the Twin Bridges to Henderson, Kentucky. Photo taken 11/07/11. Interstate 164 and Indiana 57 met I-64 at the first of two Evansville area interchanges. U.S. 41 connects with the freeway six miles further west. Photo taken by Brian Dowd (10/05/02). Westbound Interstate 64 at Exit 29B prior to the addition of I-69. Indiana 57, in conjunction with Indiana 67, was the main corridor between Evansville and Indianapolis. Photo taken by Brian Dowd (10/05/02). I-69/SR 57 south at I-64 and I-164. Construction of Interstate 69 cut across the old alignment of SR 57 and County Road 1250 South. A new overpass and access road was built to connect old SR 57 with County Road 1250 South to the west as part of the I-69 project. Ramps to and from the freeway were extended northward to meet the freeway at the new overpass. Photo taken 11/07/11. Entering the cloverleaf interchange with I-64 and I-164, Indiana 57 expanded to four lanes. Photo taken by Brian Dowd (10/05/02). One and a half miles east of U.S. 41 (Exit 0) on Interstate 164 westbound. Photo taken 11/07/11. U.S. 41 leads south from the freeway end across the Twin Bridges into Henderson, Kentucky. With a truck restriction on Veterans Memorial Parkway west beyond the end of Interstate 164, all trucks were directed to take Exit 0. Photo taken 11/07/11. The end sign for I-164 was similar to the yellow end sign at the northern terminus of Interstate 65 in Gary. The I-164 shield was removed from the panel by late 2014. Photo taken 11/07/11. A collector distributor separates from the freeway for U.S. 41. U.S. 41 north leads toward Downtown Evansville and SR 62 / SR 66 (Lloyd Expresway), the main east-west artery across the city. Photo taken 11/07/11. The c/d roadway continues to split with ramps for U.S. 41 south to Henderson, Kentucky and Kentucky Avenue, a local north-south street that was formerly U.S. 41 Business. Photo taken 11/07/11. Mile post 0.0 for Interstate 164 west. Veterans Memorial Parkway extends northwest toward S.R. 62 (Lloyd Expressway). Photo taken by Brian Dowd (10/05/02). Traveling southeast from Sunrise Park along Veterans Memorial Parkway ahead of Interstate 164 east and U.S. 41. Photo taken 05/27/11. Control cities for guide signs along Veterans Memorial Parkway referenced U.S. 41. Interstate 164 served the eastern suburbs and Newburgh before turning north to a rural junction with Interstates 64 and 69. Photo taken 05/27/11. I-164 began as Veterans Memorial Parkway entered the full cloverleaf interchange with U.S. 41. Photo taken 05/27/11. U.S. 41 continues north from Interstate 164 as the main arterial through Evansville. Despite that, Vincennes is used as the control city since this exchange spreads across the Evansville city line. Photo taken 05/27/11. North of the Ohio River, but still in Kentucky, U.S. 41 passed by Ellis Park on Green River Island at the one mile guide sign for Interstate 164. Photo taken 05/27/11. U.S. 41 intersects Waterworks Road at the Indiana state line, a half mile south of former I-164. Photo taken 05/27/11. Evansville By – Pass sign preceding the eastbound on-ramp for Interstate 164. This sign was removed when I-69 was signed. Photo taken by Brian Dowd (10/05/02). A collector distributor roadway separated from U.S. 41 north for Interstate 164 east and Veterans Memorial Parkway west. Photo taken 05/27/11. 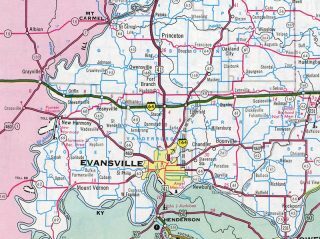 No control point for I-164 was used as it does not venture into any other city outside of Evansville. The Warrick County suburb of Newburgh however lies east of Exits 5 and 7. Photo taken by Thomas Decker (03/06/12). One mile north of Interstate 164 east along U.S. 41 south ahead of Covert Avenue. Photo taken by Thomas Decker (03/06/12). U.S. 41 continues a half mile south from the signalized intersection with East Riverside Drive to the cloverleaf interchange with I-164 east and Veterans Memorial Parkway west. Photo taken by Thomas Decker (03/06/12). Southbound U.S. 41 at the ramp for Veterans Memorial Parkway north from I-164 to adjacent Kentucky Avenue and Downtown Evansville. Photo taken 05/27/11. U.S. 41 curves to the southwest to overtake the alignment of Kentucky Avenue (former U.S. 41 Business) beyond the loop ramp for old I-164 east. Photo taken 11/07/11. Brian Dowd for assisted with the background information on Interstate 164. “bypass allows nonstop traffic around Evansville.” Owensboro Messenger-Inquirer (KY), August 3, 1990. “Highway may be Named for Orr.” Post-Tribune (IN), December 1, 1988. “Recalculating: I-164 to become I-69.” WFIE (Evansville, IN), November 15, 2013. “I-164 Renamed to I-69 by End of Year.” Indiana Department of Transportation, press release. November 18, 2014.